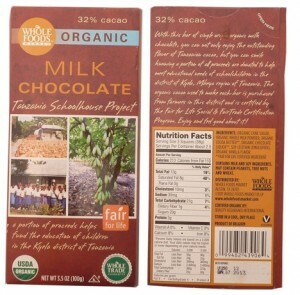 Do You Buy Fair Trade Chocolate? If So, You Should Read This | Small Farmers. Big Change. The following post was written by Fair World Project (FWP) and was first posted on their blog. Due to the importance to all of us concerned about Far Trade chocolate, certifications, and most importantly farmer impact and consumer education, we are reposting it in its entirety below. If you have comments, please share on FWP’s blog. Thank you! There has been a lot of talk about food labels in the media lately, especially if you have been following Proposition 37 in California. Transparency in labeling is important and the labeling landscape can be confusing. 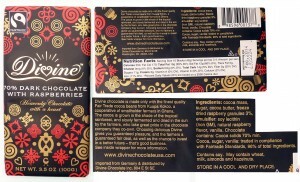 The FWP team recently took a shopping trip to see how fair trade chocolate bars are labeled. Chocolate is on our mind because last month Hershey announced that they will source 100% “certified” cocoa by 2020, without specifying what kind of certification. Later in the month was, of course, Halloween, a holiday where, by some estimates, 90 million pounds of chocolate, most of it not fair trade, is purchased. As we push for companies like Hershey’s to clean up their supply chains, ensuring that children are not forced to work and farmers and workers are paid fairly, and ask consumers to make more of their purchases products that are fairly traded, we also see a role for making sure those fair trade labels mean something. So what we found on our recent shopping trip was somewhat alarming. Here are two privately labeled chocolate bars, one from Trader Joe’s and one from Whole Foods, both claiming to be fair trade, a Fair for Life logo prominently displayed on the front. 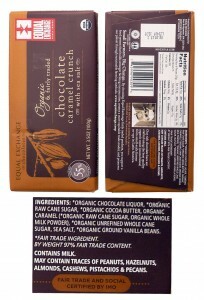 But looking a little closer, on the Whole Foods bar, it is only the cocoa butter that is certified fair trade. 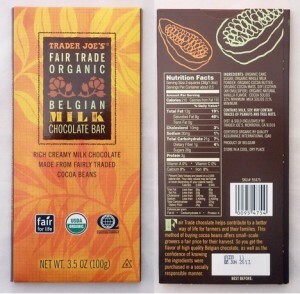 In the case of Trader Joe’s, the ingredients that are fair trade are not even identified in the ingredient list, though the description on the front panel indicates it is likely only the cocoa as well. This is a good start, but how do we know that the sugar and vanilla farmers were not exploited to bring us these “fair trade” chocolate bars? Is it still okay to prominently display the Fair for Life logo on the front of the bar, advertising this as a fair trade product? According to the official policies of IMO, holder of the Fair for Life standard, itself, the answer is no. If a product is not at least 80% fair trade by weight (in some cases 50%), it should not display the label on the front panel. We recently sent a letter to IMO asking about this discrepancy, as well as the fact that neither of these bars indicates who manufactured the bars. A key benefit of the Fair for Life program is that, unlike other fair trade labeling programs, Fair for Life requires all handlers through the brand holder to be audited and registered. Therefore, without noting the audited company responsible for making the bar, it might appear that Whole Foods and Trader Joe’s themselves have been fully audited, which they have not. In contrast, here are a few examples of companies that have the labeling right. In these bars, the ingredients that are fair trade are clearly labeled, ingredients you would reasonably expect to be certified as fair trade are, and the percentage of total fair trade ingredients is clear. These examples are especially great examples because the three companies use three different certifiers. This kind of labeling works if there is commitment on the part of the company. This all matters for a few reasons. First, if companies are permitted to use a fair trade symbol prominently on a front panel with only one certified ingredient, they have no incentive to improve their supply chains to bring fair trade sugar, vanilla, and other ingredients into the product. 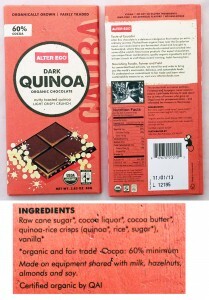 Second, the bars appear indistinguishable in terms of fair trade ingredients when looking on the shelf. Unsuspecting customers might make a decision to buy based on other factors, like price (and at last check, Trader Joe’s bar was selling for $1.99, Whole Foods for $2.99, and others for $3.99). The practices of Alter Eco, Divine, and Equal Exchange ensure that more money is going to more farmers through fair prices and premiums. These companies are dedicated to using only fair trade ingredients, advocating for farmers, and bringing quality products to the market without exploiting anyone along the way. This costs a little more to implement than sourcing a single ingredient through a fair trade supplier and slapping a label on it. Yet they face unfair competition on the shelf because as consumers we’ve been conditioned to believe what is written on the label. This is why we are taking a strong stance on misleading labels and setting a high bar for accountability when it comes to labeling. This is just the first of a series of blog posts where we will unpack what is behind labels, and we will continue to insist on accountability from certifiers and labelers.